:Live worship from Harvest Bible Chapel, Chicago. 'Found in You'. After completing a very successful tour for their last album, Vertical Church Band will continue to lead worship on tour dates, as well as leading at 5 major worship conferences in the US in 2013. Vertical Church Band is a collection of people who play every week in places all over Chicagoland as part of Harvest Bible Chapel, a place that believes singing isn't a warm-up for the sermon; singing is a warm-up for heaven. So the faces may change. The style may evolve. But the aim will stay the same. Vertical. Customer Reviews For "Rock Won't Move"
Review of "Rock Won't Move"
Many of us share the same impediment as Zacchaeus. While Zacchaeus was vertically challenged, many of us are too. Just like Zacchaeus who failed to see Jesus because he was "personne de petite taille," we fail to see God because we are so full of ourselves that all we see is ourselves. We have allowed our own achievements, our own intelligence and our own resources to stand in the way between Jesus and us. Therefore, when we try to see Jesus we cannot see Him; this is because we are spiritually standing in the way. Vertical Church Band is the gathering of worship leaders from the multi-site ministry of Harvest Bible Church in Chicago. And they have come to challenge those of us who are vertically challenged so that we can see Christ and not ourselves when we worship. Thus, their latest record "The Rock Won't Move" is nothing but the worship of King Jesus. On this their follow-up to their highly well received 2012 "Live Worship," "The Rock Won't Move" has a relatively more angular focus where the bulk of the songs tend to exalt the reliability and trustworthiness of Jesus through the ups and downs of life. 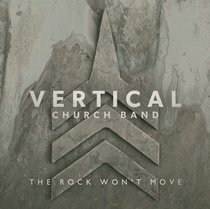 Vertical Church Band finds its six main leaders Meredith Andrews, Seth McConkey, Kyle Fredricks, Andi Rozier, Jon Guerra  Tara Rios taking the lead in penning and leading the songs of this new record. Recorded live in Chicago in front of thousands, the atmosphere is so anticipatory that you can hear the Holy Spirit enunciating in His accents loud and sweet through the praises of His people. Album opener "Found in You" is iconoclastic: it topples the common perception that the first song in a worship-set needs to rock us right into the arena. Rather, "Found in You" is a measured mid-tempo that taps into some of Hillsong's melodious riffs that invites us to clap and sing along in no time. "I'm Going Free (Jailbreak)" is already an iTunes download darling. Combing elements of ersatz rock n' roll with a melody that has a way of ingraining into our mind's jukebox, "I'm Going to Free (Jailbreak)" is one of the catchiest tunes that exalts Jesus Christ's redemptive work. After a few listens, it's a challenge not to hum along with lead worshipper Kyle Fredricks as he sings: "Glory, glory, hallelujahYou threw my shacklesGlory, glory hallelujahJesus is my libertyI'm going free." Vertical Church Band is not the first worship team to segue the hymn "The Solid Rock" into a new worship song; Hillsong Live and New Hope Oahu have recently done this on their respective songs "Cornerstone" and "Hope is Alive." However, with the Vertical Church Band, they do not just cut and paste this Edward Mote hymn into their title cut "The Rock Won't Move." Rather, using the familiar words of the hymn to work into their beautifully crafted tune, they have exhibited originality as well as accessibility at the same time. If "The Greatness of Our God" is the apex of their previous record as far as worship ballads are concerned, on this new record it's "Worthy, Worthy." "Worthy, Worthy" finds Meredith Andrews at her worshipful best: her vocal chops are right on and the way she stirs our hearts to worship with her is just nothing short of breathtaking. "I Will Follow You" ought to give us pause for thought. This song is not an easy song to sing to; it's a relentless profession of trust in Jesus despite unexplainable suffering and the apparent prospering of evil. Be warned: this is definitely not a song for those who are wobbly in their faith.